Born in Loreto in 1976. He begins piano lessons with the maestra Matassini, then he continues as an autodidact. At twelve he starts making his first experiments in electronic music and computer music, which will lead him to form several ensemble of modern music (i.e. DrinkwaterBand) with such points of reference as Stockhausen, Cage and Zappa. He then studies composition with the maestro Rusticucci, with whom he is still collaborating in the field of musical education and pedagogy; besides, he studies flute with the maestri Andreani (early music), Jousdottic and Adami (classical) Nicola Stilo (Jazz). After getting the classic school-leaving certificate, he attends the DAMS (Department of Music and Performing Arts) in Bologna, and directs his studies towards musical education and anthropology. Among his personal researches there are studies in the so-called "descriptive" music of composers such as Carl Stalling and Scott Bradley, studies in medieval music, jazz and music for films. - Laboratory of musical informatics and new technologies at the studios of Electronic Music of the Conservatory of Bologna (maestro Camilleri) and the recording studios Fonoprint. - Advanced seminar on problems and aspects of the twentieth-century music coordinated by Raffaele Pozzi. - Seminar meeting with Goran Bregovic "Balkan Melodies between cinema and music". - Laboratory of electroacoustic composition with Tristain Murail and Salvatore Sciarrino. 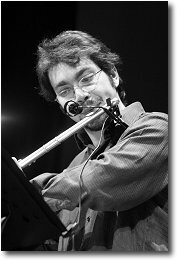 - Summer courses of the Berklee College of Music of Boston held in Perugia during Umbria Jazz: he studies flute with Matt Marvuglio, improvisation with Mark White, composition with Orville Wright and Greg Hopkins and takes part in the seminars of Wynton Marsalis, James Moody and Gary Burton. - He wins a scholarship of $5000 awarded by the Berklee College of Music (Boston) to the most praiseworthy students at the clinics held in Perugia (Umbria Jazz 2001), when he studies with Matt Marvuglio, Dave Clark, Jim Oldridge, Mark White and Jeff Stout. - He studied Jazz arrangements and compositions with the composer/guitarist Augusto Mancinelli. He's now studying Jazz and arrangement at Pesaro's Conservatory under the guide of m° Bruno Tommaso. - his passion for musicals leads him to become the musical director of a theatrical company and to establish a collaboration with some of the most important exponents of the italian musical comedy. - Musical direction of the show "Beyond The Rainbow"
- Musical direction of the show "Forza Venite Gente"
- Musical direction of the show "Beauty and the Beast".From 1998 he works at the Musical Liceo "Toscanini" of the 'International Music Institute', teaching flute, piano, musical theory and solfeggio; besides, he teaches musical education at the nursery and elementary school. From 2000 he collaborate with Carlo Gargioni as an author and arranger, also composing jingles for Mediaset and Rai and broadcating music for movies and tv. 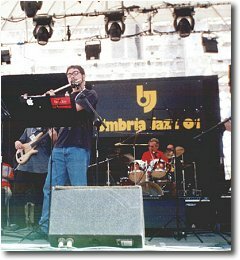 2002 become a member of the DAMS Jazz Orchestra conducted by Teo Ciavarella,others members are, among others, Antonio Marangolo, Roberto Manuzzi, Pasquale Morgante. He played with Hiram Bullock, Paolo Fresu, Hengel Gualdi, Pietro Condorelli, Tino Tracanna, Andrea Mingardi, Cheryl Porter, Massimo Tagliata, Lucio Dalla, Jeff Berlin.